5:00 P.M – 11:00 P.M.
6:30 P.M., Followed by Fireworks at 9:15 P.M.
Start: South Oyster Bay Rd. @ Enterprise Place, Berkshire Rd, Stewart Ave. 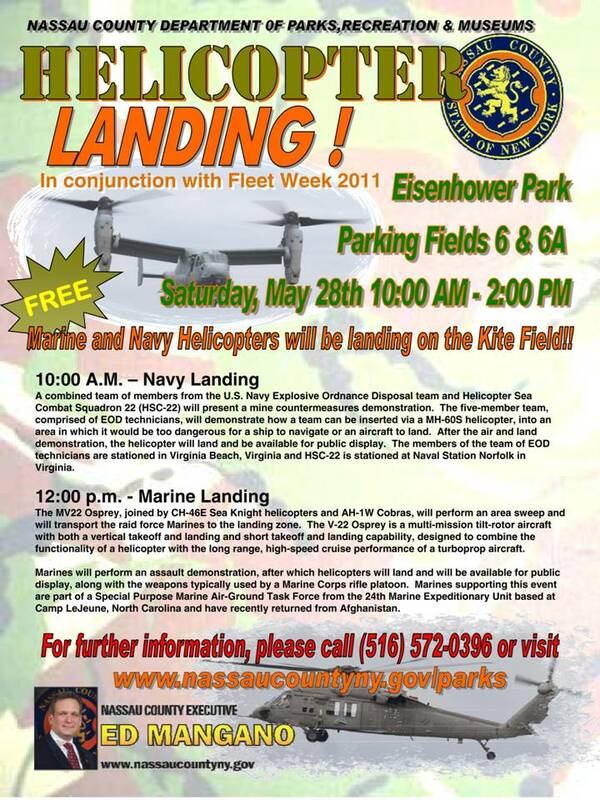 Finish @ Parking Lot of Central Nassau Guidance 950 South Oyster Bay Rd. County Executive Edward P. Mangano and Acting Police Commissioner Thomas C. Krumpter announce that the Nassau County Police Department will participate in the Governor’s Traffic Safety Committee’s grant for occupant restraint enforcement. The “Buckle Up New York, Click It or Ticket” will take place from May 23, 2011 through June 5, 2011. This initiative will consist of high visibility enforcement, targeting occupant restraint non-compliance. A zero tolerance policy for such violations will apply. The goal of the program is to increase safety belt and child seat usage in an effort to reduce serious injuries and fatalities resulting from motor vehicle accidents. "The United States was fortunate last year. Winds steered most of the season's tropical storms and all hurricanes away from our coastlines," said Jane Lubchenco, Ph.D., undersecretary of commerce for oceans and atmosphere and NOAA administrator. "However we can't count on luck to get us through this season. We need to be prepared, especially with this above-normal outlook." • The continuing high activity era. Since 1995, the tropical multi-decadal signal has brought ocean and atmospheric conditions conducive for development in sync, leading to more active Atlantic hurricane seasons. • Warm Atlantic Ocean water. Sea surface temperatures where storms often develop and move across the Atlantic are up to two degrees Fahrenheit warmer-than-average. • La Niña, which continues to weaken in the equatorial Pacific Ocean, is expected to dissipate later this month or in June, but its impacts such as reduced wind shear are expected to continue into the hurricane season. "In addition to multiple climate factors, seasonal climate models also indicate an above-normal season is likely, and even suggest we could see activity comparable to some of the active seasons since 1995," said Gerry Bell, Ph.D., lead seasonal hurricane forecaster at NOAA's Climate Prediction Center. NOAA's seasonal hurricane outlook does not predict where and when any of these storms may hit. Landfall is dictated by weather patterns in place at the time the storm approaches. For each storm, NOAA's National Hurricane Center forecasts how these weather patterns affect the storm track, intensity and landfall potential. "The tornadoes that devastated the South and the large amount of flooding we've seen this spring should serve as a reminder that disasters can happen anytime and anywhere. As we move into this hurricane season it's important to remember that FEMA is just part of an emergency management team that includes the entire federal family, state, local and tribal governments, the private sector and most importantly the public," said FEMA Administrator Craig Fugate. "Now is the time, if you haven't already, to get your plan together for what you and your family would do if disaster strikes. Visit ready.gov to learn more. And if you're a small business owner, visit http://www.ready.gov/business to ensure that your business is prepared for a disaster," added Fugate. Next week, May 22-28, is national Hurricane Preparedness Week. To help prepare residents of hurricane-prone areas, NOAA is unveiling a new set of video and audio public service announcements featuring NOAA hurricane experts and the FEMA administrator that are available in both English and Spanish. These are available at http://www.hurricanes.gov/prepare. It’s that time of year again, Prom Season. Far too often situations get out of hand on what should be an enjoyable and memorable night for high school students in Nassau County. In an effort to keep Nassau residents safe, Nassau County Executive Edward P. Mangano and Acting Police Commissioner Thomas C. Krumpter are issuing Prom Night Safety Tips for parents and teens. “I urge all residents involved in this upcoming prom season to review these tips,” said Commissioner Krumpter. Know and discuss the School code of conduct before the prom with your child. Does the school code of conduct extend to off-site functions that have been approved by the school? Know who your child is attending the prom with and discuss the events for pre and post prom parties with other parents. Talk to your teenager about the serious dangers and consequences of underage drinking and driving. If your child’s plans change, confirm the change with the parents of other children. Remind your child that you are there for them, if they need a ride home or to an after prom affair. Alcohol is illegal for persons under the age of twenty-one. Underage drinking is illegal and can result in arrest, injury, or worse. Plan ahead – make sure you have a safe plan for prom night. Learn the warning signs for alcohol poisoning and drug intoxication, contact 911 for assistance and immediate treatment. Do not allow anyone in your car or limo that has drugs or weapons. It is dangerous and everyone in the car is at risk of getting arrested. It is illegal to alter your drivers’ license or any other form of government identifications. Intensive patrol near establishments that sell alcoholic beverages. Random License Premise checks conducted by Patrol Supervisors. Fifth Squad detectives are investigating a Robbery that occurred on Friday, May 6, 2011 at 8:55 pm in Garden City South. According to detectives, 2 males victims, ages 15 and 20, along with a female and male witness, while walking along Roxbury Rd. S., were approached from behind by three male subjects who were each armed with knives. Both victims had knives put to their necks and were forced to empty their pockets. It was at this time that the male witness fled the scene and was unsuccessfully chased by the third suspect. After obtaining $83.00 US currency and an I-Pod Touch from the victims, the subjects fled northbound on Roxbury Rd. S.
Subject 1: Male white, 17 years old, 5’8” tall, wearing a blue shirt and a white hoodie. He had dark curly hair and was clean shaven. Subject 2: Male Hispanic, 17 years old, 5’8” tall, with short hair. Subject 3: Male white, 17 years old, no further description. Detectives request anyone with information regarding this Robbery contact Crime Stoppers at 1-800-244-TIPS. All callers will remain anonymous. On Sunday, May 22nd, the Historical Society will be sponsoring the first Franklin Square Museum 5K Run. If you know of a runner or would like to run yourself, it is simple to register: go to the franklinsquarehistory.org website and click on "5K Run". If you don't wish to walk or run, you can help as a volunteer on the day of the run. Contact Dorothy Vernon or any officer of the Society. Marine 1st Lt. Michael LiCalzi, who lost his life commanding a tank unit in the Iraqi desert five years ago, was a hometown boy who enjoyed many a youthful moment surfing the waves at Lido West Beach Park. Hempstead Town Supervisor Kate Murray and the Ace in the Hole Foundation, created in Michael's memory, will honor the fallen hero with a fundraising beach walk at Lido West at 11a.m. on Saturday, May 14. "The Town of Hempstead proudly welcomes the LiCalzi family, friends and admirers to Michael's favorite beach park to honor his memory and support his foundation," commented Supervisor Kate Murray. "Last year's event raised over $25,000 for donation by the Ace in Hole Foundation to select causes, and this year we hope to double that total." The Ace in the Hole Foundation has designated the United States Marine Corps 2nd Tank Battalion, the Wounded Warrior Project, Huntington's Disease Society of America, America's Vet Dogs and Adults and Children with Learning and Developmental Disabilities (ACLD) as the beneficiaries of this year's proceeds. Day of event registration will be held at Lido West Town Park, 200 Lido Boulevard in Lido Beach from 9 to 10:30 a.m. The registration fee is $25 per person, with a student rate of $15. 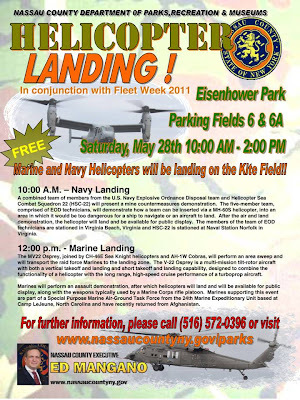 Active duty personnel and military veterans will be permitted to participate free of charge. All participants will receive a commemorative t-shirt, and a prize raffle will be held along with a free, pre-walk breakfast. A two-mile course will be set up along the beachfront at Lido West and participants may choose to run or walk the distance. For additional event information call (516) 812-3307. Franklin Square by Paul van Wie, PhD. Add $2.50 Shipping and Handling per book. How would you like to receive your book? Check one.